1.1 Getting Started Section tweak. 1.7 All links that go to leap.se should indicate this. 1.8 I think there should be a 3rd level nav for the landing page. 3.1 leap.se – the for users section on the home page should link to bitmask.net. 4.1 in main window of bitmask there needs to be a way to launch email clients. 4.2 Preferences panel, when emai service is selected there should be an email icon in the left column. Add a new section that says download Bitmask. /help/email <--link from bitmask app main window under email section: "configure mail client"
* links to thunderbird, apple mail, etc. Its better to start from the users point of view then the platforms point of view which i found confusing. Lets add a link at the bottom of this that explains the difference between anon and non anon usage. I didnt see this in the /features vpn details section. So when i click on help, i think it would be more clear if there was an “overview” link selected in the left hand nav. Install Bitmask app and register for an account. Install the Bitmask Thunderbird Extension. 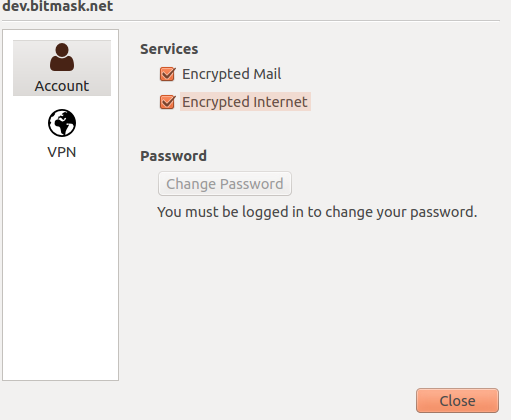 From within Thunderbird, select the menu items Tools > Add Ons… and then search for “Bitmask”.